The North of Israel (otherwise known as the Galilee) is often slightly overshadowed by some of the other places to visit in Israel. But, with so much beauty, history, culture, and, of course, adventure awaiting you in the North of Israel, it shouldn’t be that way, and no matter what your interests, you should have a problem narrowing down what to do in the north, rather than finding things to do. Here, we’ll give you five of the greatest places to visit in the North of Israel, from the city of Haifa to the Sea of Galilee, the beautiful nature and leisure spots, and the amazing parks and nature reserves. 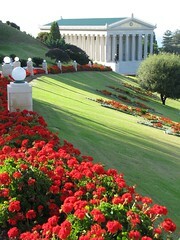 Haifa is the ‘Capital of the North of Israel’. It is Israel’s third largest city, but while it occupies a beautiful position on the slopes of Mount Carmel which has led to many dubbing it the ‘San Francisco of Israel’, it is often overshadowed by its rivals, Tel Aviv and Jerusalem. There are, however, loads of things to do in Haifa, including visiting the amazing Bahai Gardens which straddle the slopes of Mount Carmel and visiting the restored Haifa German Colony. The city has many museums and other attractions, see our guide to what to do in Haifa. For millennia, the Sea of Galilee and area around it has been inhabited and it shows! This lake, one of the lowest in the world, and its surroundings are literally flooded with history. As well as its obvious importance in Christianity as the site of many of the stories in the New Testament, and resulting Christian sites including, notably Capernaum, there is much more to do at the Sea of Galilee. For starters, you can take a boat trip on the lake, or engage in some watersports. 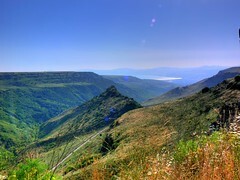 Alternatively, bike around the Sea of Galilee, or take a hike in the hills above which provide amazing panoramas. There are too many beauty spots in the north of Israel to give each one its own space here, but here are some highlights. Mount Arbel stands tall aside the Sea of Galilee, gracefully providing incredible views across the land, and also opportunities for hiking, and, the only place in Israel to go for base jumping. Mount Gilboa, slightly south of Arbel, is famed for its beautiful wildflowers in the spring, and the Gilboa Scenic Road features hikes, viewpoints, picnic sites, bike paths, and stunning outlooks. In the Golan Heights, on the other side of the Sea of Galilee, Gamla is a spectacular nature reserve. As well as the views and history, Gamla is home to eagles, who nest here under the watchful eye of experts. And finally, there is Mount Hermon, the tallest peak in Israel – ski resort by winter, and hiking and biking resort by summer. And, aside from the mountains, there’s the Hula Valley, one of the most important bird watching sites in the world located on the main bird migration route of the African Rift Valley. The Western Galilee or Northern Mediterranean Coast is very different to the densely populated coastline that will be found further south, near Tel Aviv. Far scraggier, and less built up, the Western Galilee is full of beautiful coves and bays, and towns such as Akko, a crusader port which is a UNESCO World Heritage Site, and Rosh Hanikra where amazing grottoes have been carved into the cliffs by the forces of the sea. Not a place in itself, but a tribute to the incredible array of activities that you can do in the north of Israel. Hiking and biking, are amazingly popular in Israel, and the Galilee is full of trails which are well maintained and very accessible. Many people like to explore on their own, but if you prefer, you can take a private hiking tour, and for a small price get an expert guide who will enthrall you with the history and geology of the land. If you want something more extreme, you can go paragliding, caving, canyoning, skiing (at Mount Hermon), or head into the water (at the Sea of Galilee). 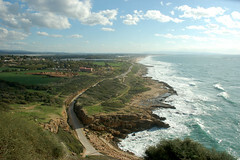 The North of Israel, as with the rest of the country has a great road network. Aside from Haifa and the Coastal Plain, the train service inland is currently not complete, and as a result, buses cross the region. Many of the beauty spots, however, are not so easily accessible by bus because they are not on major roads, or within towns or cities. If you can, rent a car, if not consider joining a tour of the north of Israel, or alternatively hiring a private guide for a day or two who will have a vehicle, and, for an affordable amount, will take you on an even greater adventure.